Everybody has a pair of sneakers. Usually it’s the most comfortable piece of a person’s wardrobe. You come home from work, step out of those uncomfortable shoes you have to wear all day and into your sneakers for lounging around. You go everywhere in them. Depending on your activities and the use they get, it might not take long for those sneakers of yours to get very dirty. While making sure the cleanliness of the rest of the wardrobe is a priority, sneakers often are overlooked when it comes to washing them regularly. How do you actually clean sneakers? It’s very simple. There are two ways to wash sneakers. They can either be washed in a machine or washed by hand. Both do the job. Washing machines might be a little more rough than the direct care one could give when washing manually but either system will result in sneakers you will no longer be ashamed to be seen in. Washing Machine Method – The first step is to remove the laces. Be careful when pulling them out. If they’re frayed in any way they could be torn in two pieces. Next, place the sneakers in a pillowcase and then directly into the washing machine. Placing the sneakers in pillowcases keeps the sneakers from being scratched as they bounce around the machine. The machine’s drum is also protected from the bumping and potential tangles caused by the laces. Set the machines setting to delicate and use cold water after adding about a half cup of detergent. When finished, the sneakers should be allowed to air dry. Stuff paper towels or newspapers into the shoes so that they retain their shape. Don’t use a drying machine as the heat might damage the sneakers. Washing By Hand – Again, remove the laces and also inserts if the sneakers have them. Prepare a solution of soap and water or use a pre-purchased athletic shoe cleaner. A toothbrush can be used to clean the sneakers all over with the soap and water solution. Then using the same solution clean the inserts and laces. Once completed, hold your shoes under a running spigot or hose of fresh water until the soap is washed away. Any of the remaining solution can be wiped off with paper towels. Using more paper towels and/or newspapers, stuff the shoes so they retain their original shape as they dry. Replace the paper towels should they become saturated with water. Allow to dry in the sun if possible as the sun will actually help make white sneaker whiter. Once dried, replace the inserts and laces. To keep them fresh, baking soda can be sprinkled sparingly on the inside. The cleansers that you choose are important as some are better than others. The best for cleaning shoes are stronger cleansers like Comet, Mr. Clean Magic Eraser, and Greased Lightning. 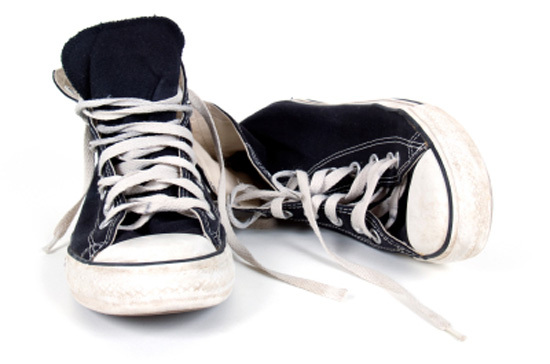 Now your sneakers should be thoroughly cleaned. Make sure they’re completely dry before using them as this will extend their life. Have fun showing off your like-new sneakers. What are the Differences Between Washing Cycles?